I love reading to Little Miss, and she seems to enjoy it too when she is in the right mood. I try to make it a point to read at least one story book to her a day. It is just such a bonding experience to hold her in my lap and read to her. I want to instill the love of books in her like I had as a child. I think it is really important. 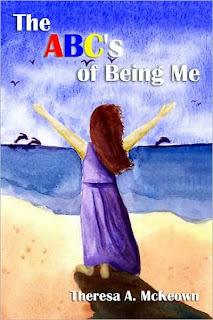 When I was given the opportunity to review Theresa McKeown's book, The ABC's Of Being Me, I was excited to share it with Little Miss. It is such a sweet book that goes through the alphabet and has a poem addressing a character trait for each letter. Each is to show the child of the importance of character and how many different characteristics we possess. The book has 26 different poems, so with Little Miss it took 2 days to read. I love that it is easy to just stop and start as you please. The illustrations are all done in watercolor which I thought was neat, because you never really see that in children's books. Each picture shows the characteristic being displayed somehow and they do a very good job of it. The book obviously is a little over Little Miss's head and will be for a while, but I will keep reading it to her so she knows the importance of each characteristic she possesses. If you are interested in learning more about this book you can check it out over at Dorrance Publishing. I received a complimentary copy of "The ABC's Of Being Me, as a member of the Dorrance Publishing Book Review Team. Visit dorrancebookstore.com to learn how you can become a member of the Book Review Team. I was in no way compensated for this review. The opinions expressed are my own.